The Biomolecular Mass Spectrometry Facility is a state-of-the-art centre offering service analyses and research opportunities for investigating the mass, structure and conformation of biomolecules and their complexes. The Facility operates an ad-hoc sample analysis service. Samples can be submitted for analysis at any time for molecular mass measurement, protein/PTM identification and non-covalent mass measurements. We welcome all users from the University of Leeds, other academic institutions and industry. See the service analysis page for more information about sample preparation and how to submit samples. The MS Facility is well-equipped with a range of instrumentation. As well as nine mass spectrometers (five with ion mobility capabilities) we have four UPLC systems, an HDX module with LEAP automation system and an excimer laser. 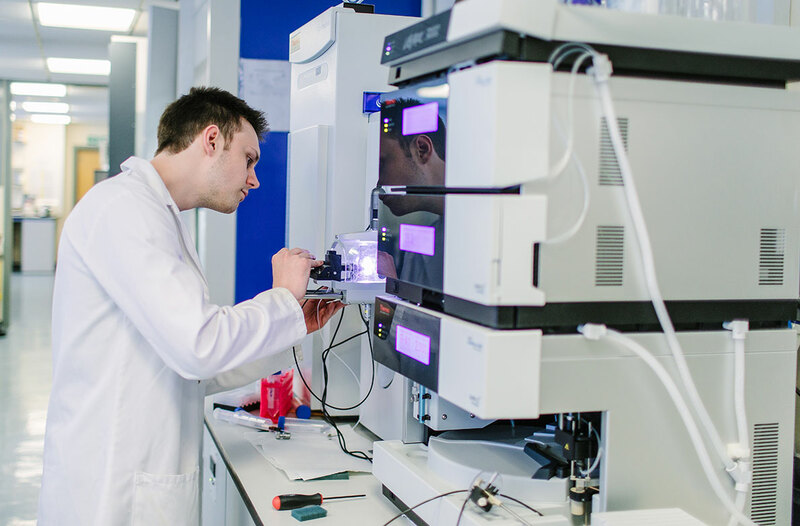 Research carried out in the Facility focusses on the use of both Ion Mobility Spectrometry-Mass Spectrometry and chemical foot printing approaches to probe the three dimensional structure of proteins and their complexes. The MS Facility can also offer a method development service for non-routine analyses. Please see the page Research & Instrumentation.